We know your clients are everything to you. You want to give your clients the royal treatment so they'll stay loyal and spread the word about your fab business. So how can you make sure that you’re giving your clients the best experience possible? With GlossGenius, our product makes it easy for you to give clients the best experience possible. 1. Create a beautiful business presence online. Visuals: Rather than using paragraphs of text to describe all of your services, use photos that show your potential clients what kind of services you provide. Minimalism: As a beauty professional, your website should be aesthetically pleasing. However, while you definitely want to be able to show your creativity, you also don’t want to overwhelm a client with too many colors, buttons, or fonts. User Experience and Ease of Use: Ideally, a client will spend almost zero time trying to navigate your site. It should be immediately clear to a client who clicks on your website where they should go to book their appointments. Keep the booking portion of your website accessible and clear with a large “Book Now” button in the center of the page. Getting a beautiful business presence online could seem daunting but our built-in booking website feature makes it easy for you to elevate your business brand in seconds. If your booking page is the first impression that potential clients have of you, they’ll see that you’re elegant and professional with our design. 2. Promote your site to clients. A professional-looking website will only increase your bookings if your clients know about it! Put your website URL on your social media profiles to make it easily accessible to clients. 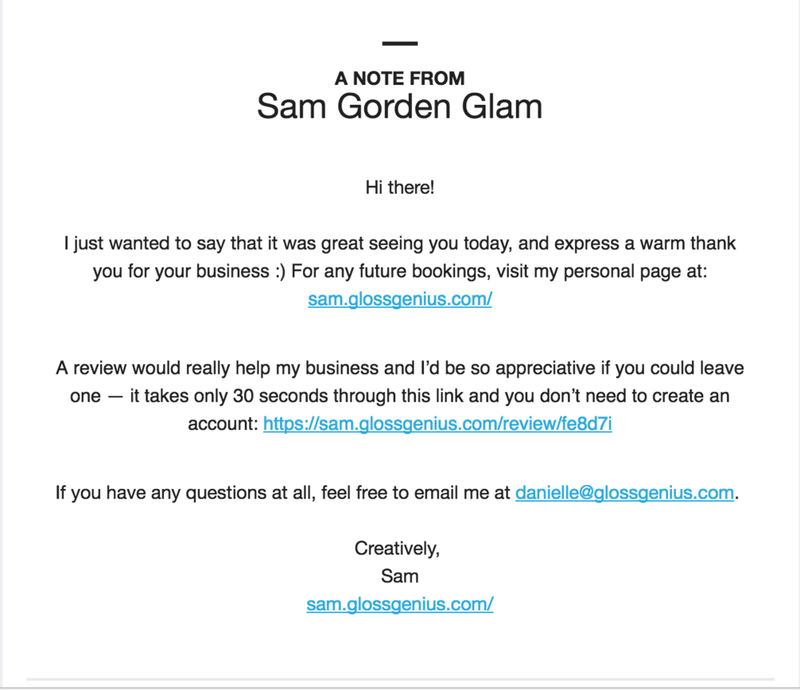 Use text or email to send a little note to clients. Let them know you’re thinking of them! Plus, take advantage of some of the free promote and marketing tools that we give you to fuel your business and client relationships! Read more about how to use text message marketing to increase your appointment bookings. Save yourself a ton of headaches, step up your professionalism and streamline all of your communications! Show clients that you take your business seriously and value their schedule by taking the initiative to notify clients about appointments. You can easily control what reminders and confirmations you want to automatically send to clients through GlossGenius. 3 Days Before: Confirm your appointment. Clients often sign up for appointments far in advance, so you want to put the appointment back on your client’s radar. To ensure your client is coming to the appointment, confirm with them through a confirmation text or email. We take care of these automatically for you. 24 Hours Before: Send a reminder to let your client know you are expecting them and are ready for an appointment. We take care of these automatically for you. 4. Jog your memory by looking at client notes. Did your client just go through a break up? Do they have kids? Or favorite products? How can you keep track of it all? The best way is to take client notes. After an appointment is over, jot down a few notes about the conversation that you had with the client and product preferences. Then, before your next appointment with that client, read through the notes quickly Your client will think you’re a genius with perfect memory, and she'll be reminded that you really do care. It might seem hard to keep track of your client notes but we make it easy. GlossGenius automatically saves client history—and sends it to you before every appointment. Giving you a genius way to keep relationships personal… and clients coming back. 5. Get clients to reschedule their next visit before they leave. At the end of your appointment, you should always let your client know that you want them to book their next appointment. It probably feels awkward to go up to someone and say: “Hey, I want you to book your next appointment,” especially when the client isn’t used to setting appointments so far in advance. So what can you do to get your client to book their next appointment? Timing: do this directly after payments-- it’s harder for your clients to say no in a face-to-face conversation! If a client tells you they need time to check their calendar, try to still follow-up with them! With GlossGenius, rebooking comes immediately after checkout, giving you a natural way to keep your clients coming back. Link to Website: Always give your client the option to access your website. With these steps, your clients are guaranteed to keep coming back. Want to download a tool that can do all this AND remember clients’ birthdays? Download GG here.